ccar3825 has no other items for sale. 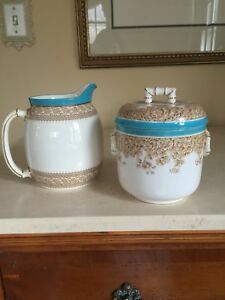 Details about Antique Royal Worcester Set Covered Jar And Pitcher Turquoise Trim Floral RARE!! Antique Royal Worcester Set Covered Jar And Pitcher Turquoise Trim Floral RARE!! Dolls, Doll Clothing & Access.